Feeling so much better today. My feet are beginning to forgive me, and my knees are almost back to their daily pain instead of the almost intolerable aches of yesterday. Have I mentioned that they creak? If you’ve ever seen the old Rodgers and Hammerstein’s Cinderella television production starring Lesley Anne Warren you will understand. One of the ugly step sisters (as if it weren’t bad enough that she was ugly) had creaking knees that made noise, that’s me. My days of sneaking up on people are over, I sound as though I click castanets when I climb the stairs. Most days its just part of my life, some days are like yesterday when I start picking out which Rascal I want to drive. I’ve become accustomed to the pain. My doctor tore her A.C.L. a few years ago. When she saw me she said I was the first person she thought of, and then she told me she sold her two-story house and bought a ranch style home because she now had a bad knee. I called her a wimp. I probably go up and down our stairs a minimum of a dozen times a day. I’m stubborn, I refuse to give up. Today was a day that I was up and down more than twenty times while working on my project. I am so happy with the results of the glue and burning technique that I am anxious to see where it can go next. I went into the studio to see what I had to play with. 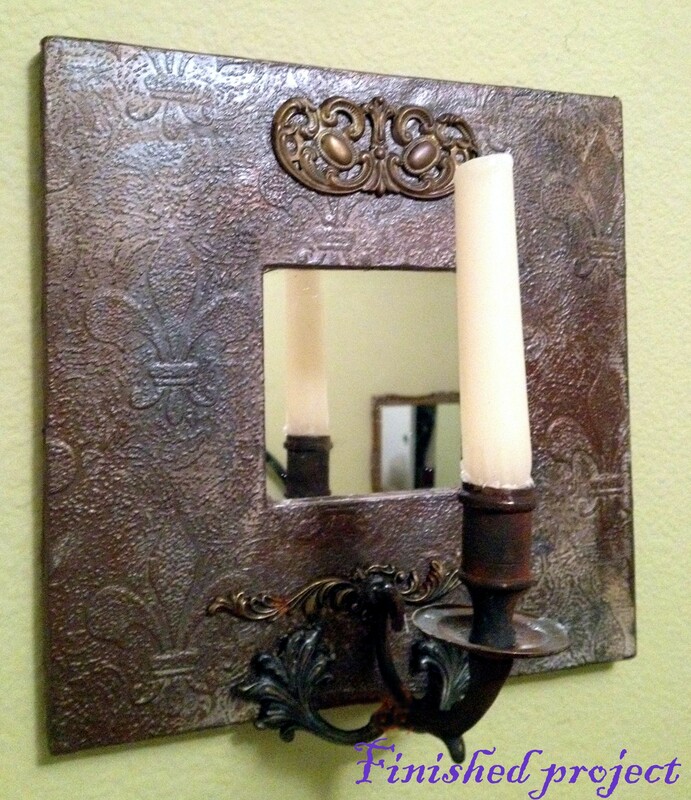 I had purchased a couple of four-dollar mirrors from Ikea. 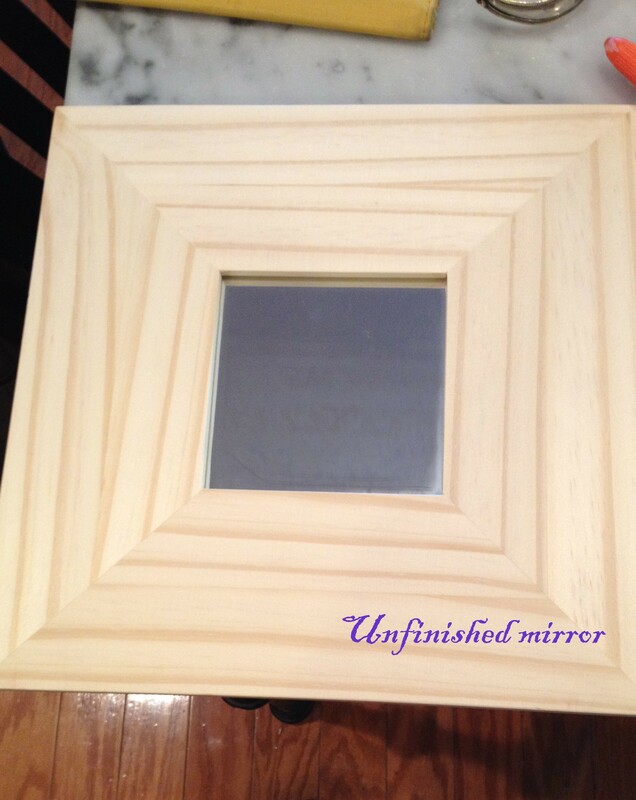 They are unfinished wood and a terrific surface for painting or decoupage. Originally I had planned to just burn the glue right on there, but then I remembered that I had some Anaglypta wallpaper. 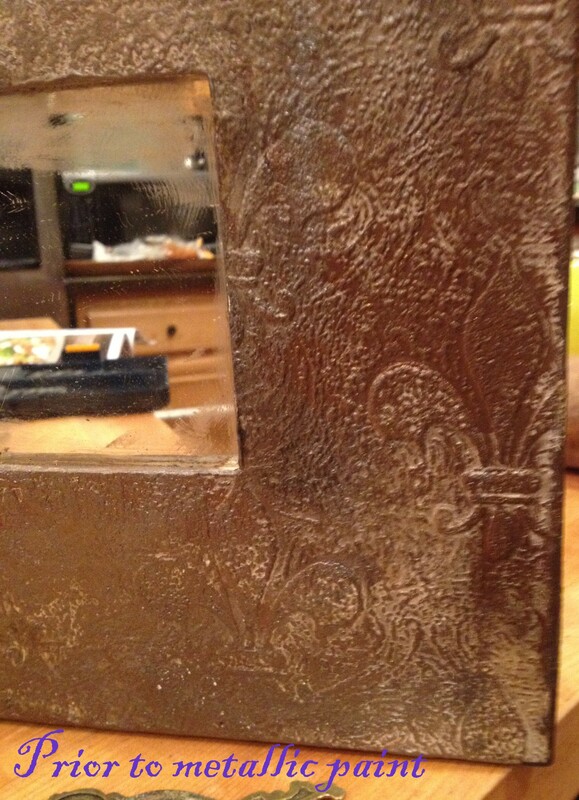 It is wallpaper that is embossed. (Created by Thomas Palmer and introduced in 1887. Thank you Wallpapersplus.com for the history lesson!) I’ve used it for covering hat boxes before. I have a couple of rolls from my Dad, one of the advantages of being the artistic daughter of a house painter is that there is some pretty cool stuff lying around. One of the rolls has a Fleur-de-lis pattern on it. 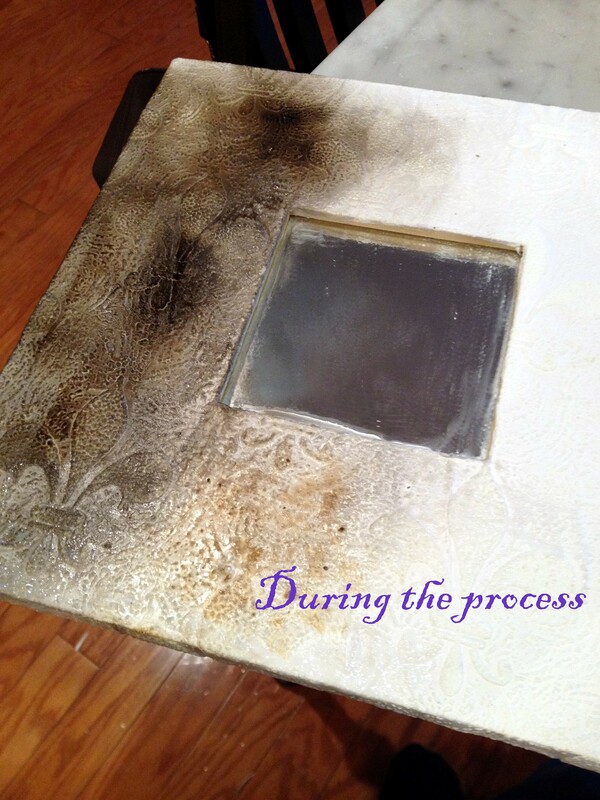 I glued it to the surface of the wood frame and then added another coat of glue on top. Then I burnt it. Very cool, looks like tin ceiling tile. I added my usual metallic paint treatment to it. I loved how it looked but it seemed ordinary to me. Up the stairs again. I have a box of metal odds and ends. Old drawer handles, door plates, keys, springs, etc…thanks again Dad. I figured there had to be something I could add. I toyed with the idea of adding something to hang stuff on, like necklaces, but it seemed impractical. One of the drawer handles stood out so I glued it to the top. Still not enough. Back up to see what else was there. I dumped the box out. At the bottom was a piece from a very old candelabra that sits in my room. It had fallen over and a piece broke off. I saved it because I save everything. 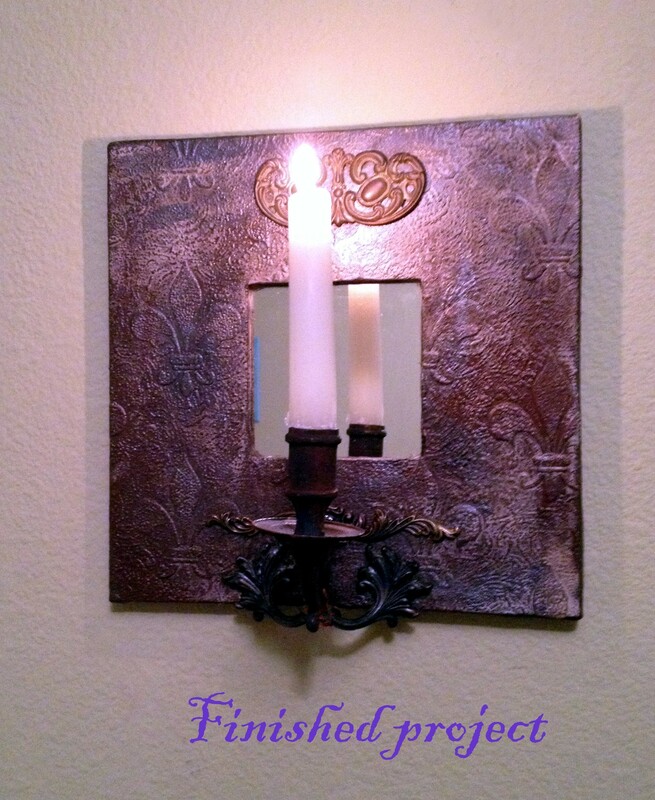 That’s when I decided to add it to the front of the mirror to turn it into a mirrored sconce. The addition of two other vintage drawer handle pieces to brace the candle cup were a great addition. It isn’t fully completed. I may or may not add some paint to the metal pieces, and I have some soldering to do tomorrow, but it looks so amazing I hot glued the pieces enough to put it together for a photo tonight. 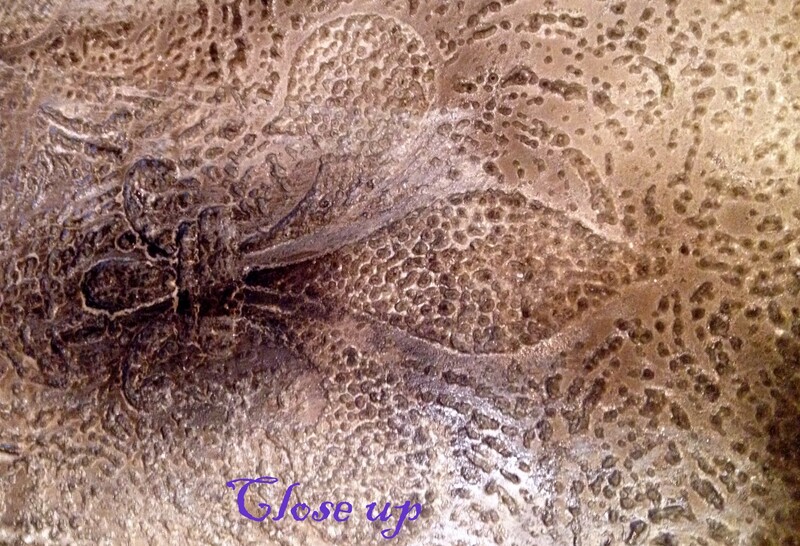 This entry was posted in art, Art and my life, Crafts, Fine Art, Humor, Recycling, Uncategorized, Upcycling, Words, Writing and tagged Acrylic painting, art, Crafts, Family, Fine art, humor, life, projects, Recycling, thoughts, Upcycling, Visual arts, writing. Bookmark the permalink.